Why is it that some teachers have a kind of magical charisma and charm which sets them apart from their peers? This book gives us a fresh and exciting answer - They have the classroom X-Factor! 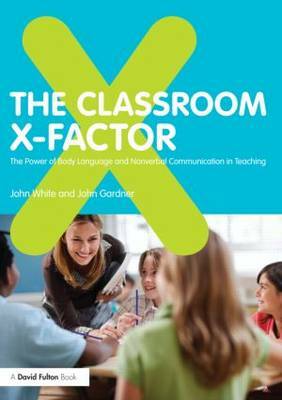 White and Gardner's gripping text, The Classroom X Factor, examines the notion of having what the public has come to call the `X-Factor' from the perspective of the teacher, offering fascinating insights into the use of non verbal communication in the classroom. In addition, the book provides a section containing fictional stories that aim to contextualise the findings detailed throughout the text. The inclusion of chapter summaries, questions aimed at identifying the readers' own `X-Factor', lesson exemplars and a user-friendly self-evaluation framework all work together to make the book a stimulating and easy read where reflective learning and the practical application of classroom techniques are the order of the day. This comprehensive guide to developing the classroom X-Factor within you will be of value to teaching and learning and is of immense use to both practising and student teachers and to schools seeking to develop models of reflective practice. It will also be of interest to curriculum and assessment agencies, policy makers, academics and others whose roles involve the design, provision, support and evaluation of teachers' efficacy in the classroom.